Nicky Brett at the World Indoor Championships. There’s been double disappointment for local bowler Nicky Brett at the World Indoor Championships at the Potters Resort in Norfolk. 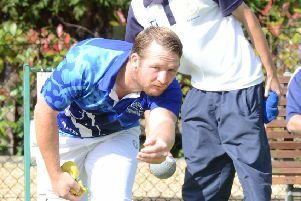 Just 24 hours after missing out in the open pairs final with Greg Harlow, Yaxley man Brett lost the mixed pairs final today (January 22) as well. 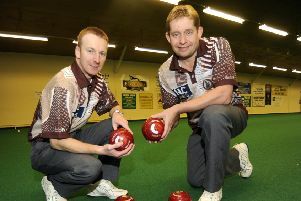 He teamed up with New Zealand debutant Helen Carman and they lost 2-0 in a tie-break to the England pairing of Ellen Falkner and Robert Paxton in the decider. Brett was on fire in the opening set with a mixture of inch perfect draws and conversion shots to the extent that he and his partner raced to a 15-1 victory. It was a completely different story in the second, where a four on the fourth end for Falkner and Paxton, when trailing 1-2, turned the momentum in their favour and they strolled to a 10-3 victory to force the final into overtime. Brett held shot on the first end of the tie-break, only for Paxton to enjoy a slice of good fortune when pushing one of his short bowls in for shot, but there was nothing fortuitous about his match winning draw in the second. Afterwards, Brett admitted that the four they conceded on the fourth end of the second set turned the match: “The first set score was probably a little flattering, but that four appeared to be the key for them. Brett now turns his attention to the singles and a second round clash with six-times champion Alex Marshall on Thursday afternoon.